Applied Graphene Materials (AGM) is taking advantage of the broad materials and engineering platform provided by the UK’s Advanced Engineering Show (www.easyfairs.com) to introduce its two new Genable® product ranges to the market. AGM will also be helping their customer, James Briggs Ltd, (Oldham, UK) to announce an industry first, that being their new Hycote® graphene enhanced anti-corrosion automotive primer – developed with AGM and employing Genable® dispersion technology. Genable® 1000, 2000 and 3000 series dispersions are graphene based formulation additives, delivering outstanding barrier and anti-corrosion performance on metal substrates. The Genable® 1000 series is engineered to significantly enhance and reduce the content of existing anti-corrosion additives, the Genable® 2000 series, delivers outstanding anti-corrosion performance specifically on aluminium substrates and the Genable® 3000 series materials are sustainable active, non-metallic, anti-corrosion additives. 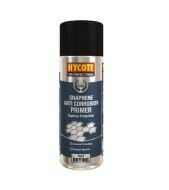 James Briggs Ltd new Hycote® graphene enhanced anti-corrosion automotive primer incorporates a Genable® 1000 series additive and demonstrates a remarkable improvement in anti-corrosion performance – cost effectively. AGM is also announcing the launch of two new high-performance thermal paste adhesive materials- Genable® 4400 and Genable® 4300. The new products are designed for use in thermal management applications, either directly as a paste adhesive and gap filler, or as potential base additives to enhance other formulated systems. The two products have been formulated to deliver different processing viscosities to suit specific application requirements and will provide in-situ thermal conductivity in the region of 3-6 W/(m·K), combined with good levels of lap shear strength. AGM anticipates applications within formulations for bonding, potting, sealing and encapsulation for Space, Electronics and Automotive components.